These crab cakes are very delicious and something you would eat at a fancy restaurant. Well … did you know that they can be easily made in your own kitchen? 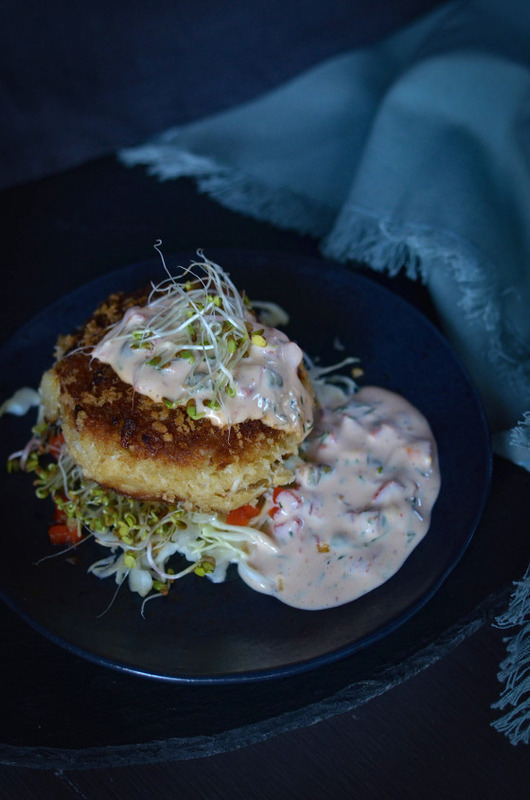 These crab cakes are perfect for dinner with Valentines Day just around the corner. There is alot of different sauce that will be good with them, this is one of my favorites, and this beurre blanc sauce will go well with it as well. alfa alfa sprouts or any other type. saute onions in butter until lightly browned and soft. Drain and squeeze all liquid from crab, place it in a mixing bowl. Whisk together mayo,egg,mustard,salt,hot sauce,old bay seasoning ,Worcestershire sauce. Add it to crab. Add sautéed onions to bowl with crab.Add breadcrumbs.Mix all together. Form crab mixture in to 8-10 patties. Coat with panko crumbs on both sides. Heat a frying on medium heat. Add oil. Fry crab cakes on both sides and transfer to a plate when done. To plate and serve as pictured above, mix cabbage with sprouts,red peppers, salt, and squeeze of lemon juice. Place cabbage mix on bottom of plate. 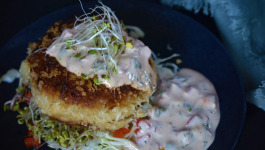 Arrange crab cake on top and pour over with sauce on top.